The start of a new school year, and the start of a new semester, brings a grinding halt to any shoptime. Aside from my normal teaching duties, as Director of the University Jazz Ensemble I need to write all of the arrangements for the semester, and write them soonest, so the Ensemble will have them to rehearse and practice (PLEASE, practice!). But, that is now done, so I can get back to the plane cabinet. 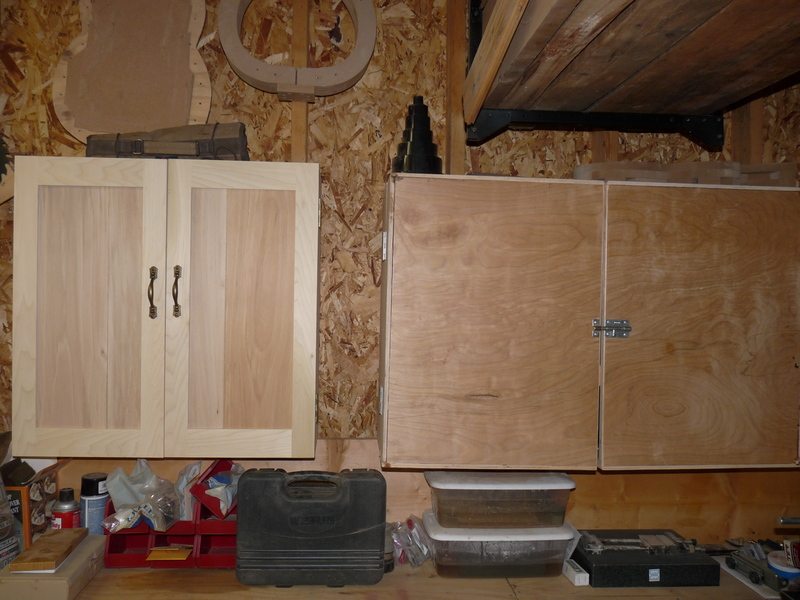 The doors went together fairly quickly, poplar for the frames, and some 1/4″ sycamore that I had on hand for the panels. Instead of glueing up the sycamore to get the required width, I decided to shiplap them loose, adding a champfer to highlight, rather than hide, the seam. Mortise and tenon joinery, testfitting, and glue up and — voila! — doors. Then I mortised in the hinges (basic hardware store stuff, nothing fancy) and drilled for the handles. One of the doors was hanging a bit too crooked, even for shop furniture, so I dowelled the screw holes and redrilled them. (I didn’t have my self centering drill bits on hand, so the first holes on that one hinge were a tiny bit off.) After rehanging it, I realized that putting the handles on before final fitting was a mistake. Always wait until the doors are hung before marking and drilling for the door handles. It’s a good thing this is only shop furniture. The doors could use some edge planing at the top and bottom, but with the handles already off, I’m not going to worry about it. Now that the cabinet was finished, I had to move the old plywood cabinet (where I had been housing some of the planes with chisels, etc.). 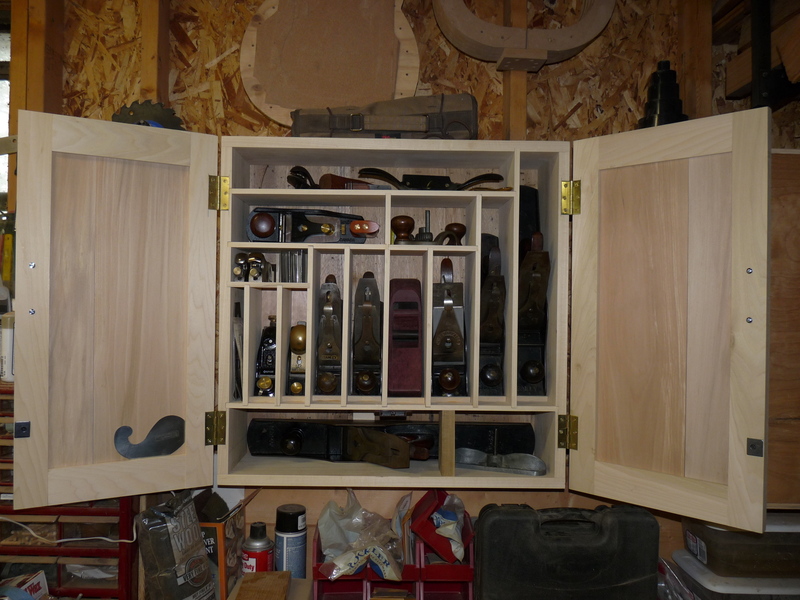 With both cabinets emptied out, I rehung them and starting fitting them with the planes, and making new fitting for the chisels, etc. Hopefully the new cabinet won’t make the old, plywood, slapped together one feel too bad about itself. Now the planes have a home, complete with slots for scrapers, and room for more miscellany. The old cabinet can now accommodate all of my assorted chisels, from fine Japanese chisels to utility chisels used to scrape glue. I carefully measured, marked and drilled holders for all of them, trying to maximize the space. 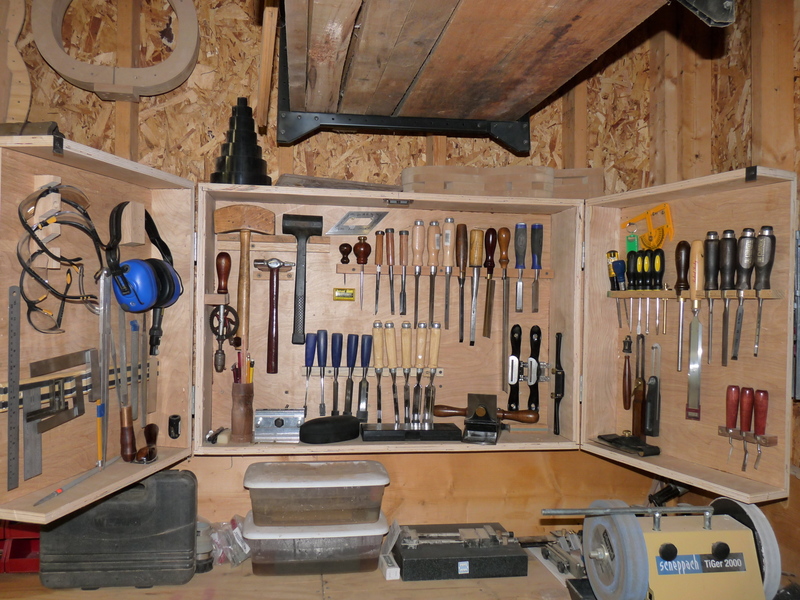 I still have a little bit of room for additional assorted hand tools, but its a good start. I’m sure when I get back from the Woodworking in America conference, I’ll have new stuff to find room for. As I was cleaning and clearing space to hang the cabinets, I found a not too subtle reminder of just how hot it has been this summer. I use parrafin wax to lube screws and plane bottoms. 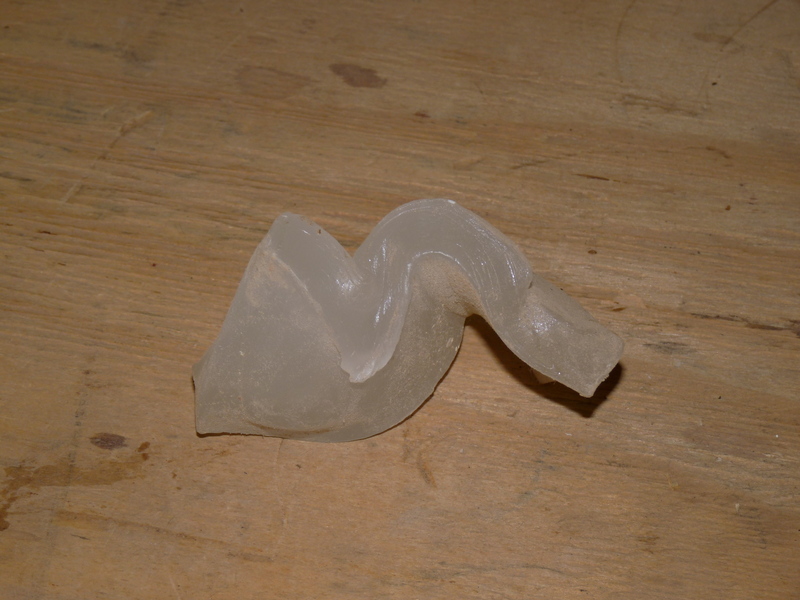 This block, the standard rectangle of paraffin wax for canning, had been on top of a box of screws. This entry was posted on September 11, 2010 at 6:40 pm and is filed under Acorn House. You can follow any responses to this entry through the RSS 2.0 feed. You can leave a response, or trackback from your own site.